After half a season lost to a lockout, the National Hockey League (NHL) will resume play in the latter half of January. To say that this has hurt the league is an understatement. This comes after losing the entirety of the 2004-2005 season for the same reason: millionaires squabbling with billionaires. 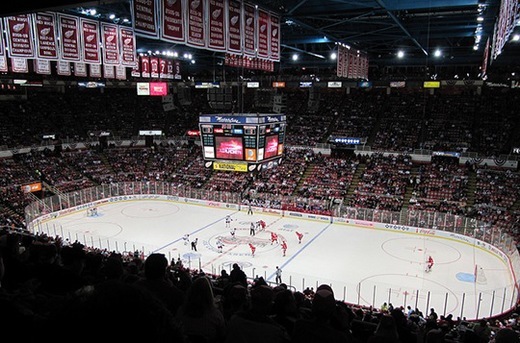 What does this mean for the area's local team, the Detroit Red Wings, and the NHL as a whole? Simply put, the NHL has an image problem. To call the league a niche sport at this point would be generous. The league likes to bill itself as one of the "Four Major Leagues" in the United States; however, the reality is quite different. In terms of popularity, the NHL comes in 7th or 8th place, behind the likes of the NFL, NBA, MLB, College Football and Basketball, NASCAR and even Major League Soccer. After the 2004-2005 lockout, TV ratings and revenues struggled to come back. Teams were playing in half-empty arenas, and did so for years. Finally, in 2010, the NHL started to make significant progress expanding its fan base and popularity after an exciting tournament at the 2010 Winter Olympic Games in Vancouver. The 2012 lockout was detrimental to this progress. The NHL has a small fan base as it is; however, the fans that do spend their hard-earned dollars to attend games and buy merchandise love the sport with a capital L. The second work stoppage in eight years has crushed the enthusiasm of even these die-hards. The NHL is going to have to work overtime, and pull out every marketing trick it can think of to lure not only new fans to games, but also ones that have followed the sport for decades; they've simply had enough. On a local level, things are not quite so bleak as they are nationally; this is an area that bills itself as Hockeytown, after all. For the better part of a decade, the Red Wings had been the hottest ticket in town, and--no doubt--are still exceedingly popular; it's a team with a storied history that goes back nearly a century. There is also the added benefit of being in close vicinity to Canada, meaning playing hockey in the winter is a right of passage for many. But this lockout has been a rude awakening: the downturn in the economy and the rise of the Detroit Lions had already begun to cut into ticket sales. 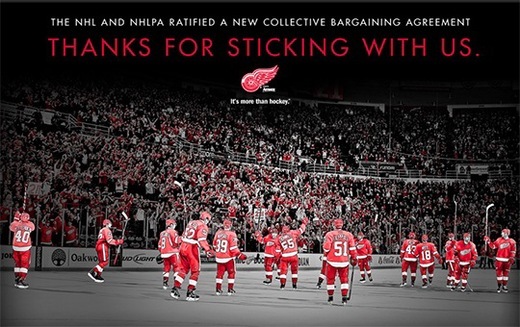 Now, with even die-hard fans claiming to be fed up, the Red Wings' marketing department has some work to do. They not only need to get new fans, but old fans as well to come through the turnstiles. This work stoppage has greatly damaged the reputation of a great sport for the second time in less than a decade. It is going to take a lot of time, and plenty of ad dollars to restore the National Hockey League to its old greatness.